Given the age, rarity, and fragility of most of its collections, AAS maintains a closed-stack library. This means readers cannot browse the shelves themselves, with the exception of the collection of bibliographies, reference works, and genealogical aids in the reading room. All other collection materials may be requested through the online request system My Web AAS either directly from the catalog, or after consulting finding aids, or card catalogs. 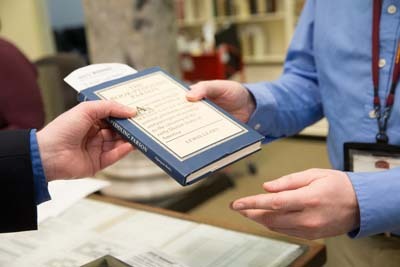 Staff members will retrieve the requested items and bring them to the readers at the reading room tables. Readers are responsible for the use and return of materials they have requested and may not lend or exchange them with other readers. All collection materials should be handled as little as possible with clean, dry hands. Books and pamphlets must be examined in book cradles. Additional reading room policies will be discussed including special seating and handling requirements during the new reader orientation. Personal books may be brought into the reading room, but must first be registered with the receptionist. Cameras are allowed in the reading room. However, the use of a flash, tripod, or other special equipment is not permitted. Cell phones may be brought into the reading room if the ringer is turned off. Please answer calls in the reception area rather than the reading room. A telephone booth in the reception area may also be used for local calls. No pens or bags of any kind (including purses, briefcases, or any other enclosures) may be taken beyond the reception area. Coat racks and lockers are provided for outerwear and personal items. Food and drink is not allowed in the library. Readers may bring lunches to the Goddard-Daniels House, located across the street at 190 Salisbury Street, or ask at the receptionist for a map of local restaurants. Mon, Tu, Th, Fri: 10 a.m. - 5 p.m. Wed: 10 a.m. - 7 p.m.